The Geometer's Sketchpad (GSP) is the absolute best way to learn geometry. This dynamic geometry software program not only allows you to create any geometric figure, you can also do numerical analysis as well. GSP will make your homework much easier and also much more fun! Sketchpad allows you to draw geometric figures by using the features such as points, lines, circles and more. You can also perform transformations, constructions, and measurements. For example, you can draw a line segment and then measure its length. When you click and drag the segment to change its size, the measurement automatically changes simultaneously. The picture shown below is a copy from a GSP document that models the Pythagorean Theorem. The theorem says that right triangles must have side lengths so that the hypotenuse squared is equal to the square of the two legs when you add them together. In this case, both are equal to 7.82 cm. Again, if I were to change the size of the triangle, the measurements would automatically change. In other words, students can see that no matter what size right triangle they have (and they can look at hundreds of them in minutes by clicking and dragging), the theorem is always true. 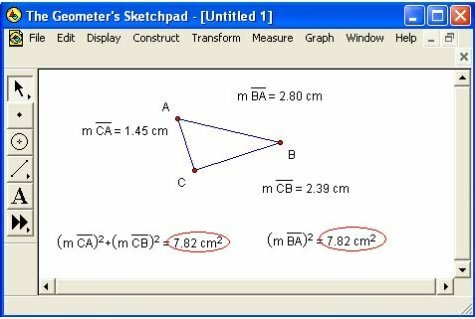 The Geometer's Sketchpad was created by a company called Key Curriculum Press. They specialize in providing innovative mathematics equipment to make education easier and more enjoyable. You can learn more about GSP at http://www.keypress.com/sketchpad/ or you can also do a Google search to find countless recommendations. This incredible geometry software program is obviously available through it's companies website. The student edition costs about $40. However, the same program is available through this exclusive offer from Overstock.com for about $32. incorporate GSP into your classroom, take a look at the Grade A GSP tutorial which teaches the basics of GSP and the three undefined terms of geometry: the point, line and plane. Return from our page covering the best geometry software to more free geometry help. You may also want to explore other subjects at the Grade A homepage.